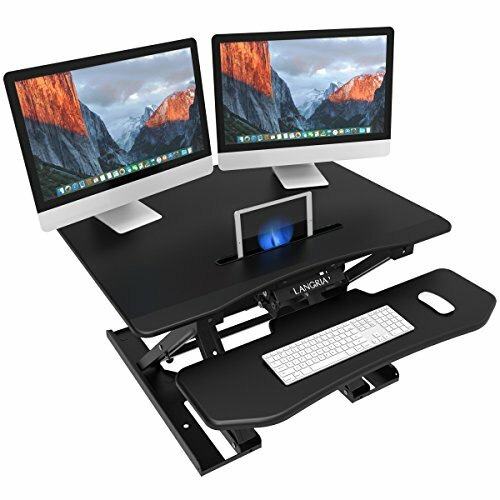 SPACIOUS SIT STAND DESK CONVERTER: With 31.5"x 24.5" desktop + 28"x 9.5" removable keyboard tray, Our large sit to stand desk riser provides exclusive large work area, which is able to fit two monitors, mouse, keyboard, phone, and more, customize your work area and space saving. SAFE AND STURDY: LANGRIA's pneumatic standing desk embodies high-quality construction. Its MDF and steel material and side X-frames design make the desk sturdy to hold up to 33lbs - weight capacity of keyboard is 4.5lbs. MULTIPURPOSE DESIGN: Comes with anti-slip pads and a unique embedded groove that holds your smartphone or tablet at an easy viewing angle, with USB Port Charging. Best match with your computers. If you have installation questions, please feel free to contact us by langriaservice@gmail.com for MOUNTING INSTRUCTIONS, and we will response you in 24 hours on weekdays.